Since dyeing is carried out at low temperature a good preliminary scour is necessary to make the cotton easily permeable. The dye vessel is filled with soft water and the dissolved oxygen is removed by the addition of 1 oz / 100 gallans of sodium hydrosulphite. The required amount of reduced indigo is added from the stock vat and the soods are immersed in the dye liqour at 20 to 25 º C ( 68 to 77 º F ) and agitated for 15 minutes. It is important that a machine or method od handling should be used in which the goods are totally immered to prevent premature oxidation from taking out, the exces which are exposed to the air. At the end of 15 minutes the goods are taken out, the excess liquor is squeezed back, and leuco compound is oxidized by exposure to air. The first dip will only give a pale blue and the sequence of operations is repeated 2, 3, 4 or 5 times until the necessary depth of shade is obtained. 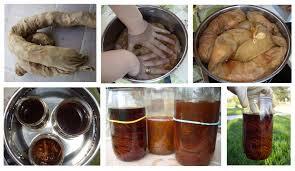 Cellulose has not great affinity for the leuco compound of indigo and heavy shades must there fore be built up the successive immersions because an excessive concentration of the dye in the liquor leads to unsatisfactory rubbing fastness. Exhaustion can be improved by the addition of 5 to 40 present of common salt. According to the depth of shade and the liquor ratio. Deep shades are built up by successive in a series of liqour of increasing indigo and thus the first bath might, for example, contain 0.3 g./l of reduced indigo and concentration would increase until, in the sixth, it is 3 to 4 g / l. a counter flow system may be used, the first bath being certified from the second , and so on, all addition of reduced indigo being made to the final liqour. When the dyes goods have been exposed to air for large enough for oxidation to be complete, they are second through to remove any insoluble indigo blue deposited on the surface of the fibers. The main economic advantage of continuous dyeing are to be derived from the rapid production of goods with very consistent shade. Speeds of 160 meters per minute are possible. But, the potential benefits have been increasingly curtailed by the shrinking size of individual dye lots, despite successful efforts by machinery manufacturers to make changing colors as painless as possible. When the threaded up length of a normal continuous dye range may be 400 meters, or even more, and the length of a particular dye lot may be only 1800 meters, this spells potential shade consistency problems for the continuous dyer. The Pad-Steam process for continuously dyeing vat dyes is suitable for most flat cellulosic fabrics. Here a vat pigment dispersion is padded on to the goods and dried. A wet pick up of 60 to 70% might be suitable for many cotton and polyester/cotton flat goods. This process would be unsatisfactory for corduroy and terry cloth because the pigment will migrate to the fabric surfaces during drying. In addition to the issue of migration is the adverse surface effect ( flattening, distortion), if goods are not run wet-on-wet, avoiding pre-drying and drying cans.